WANT TO PARTNER WITH US? 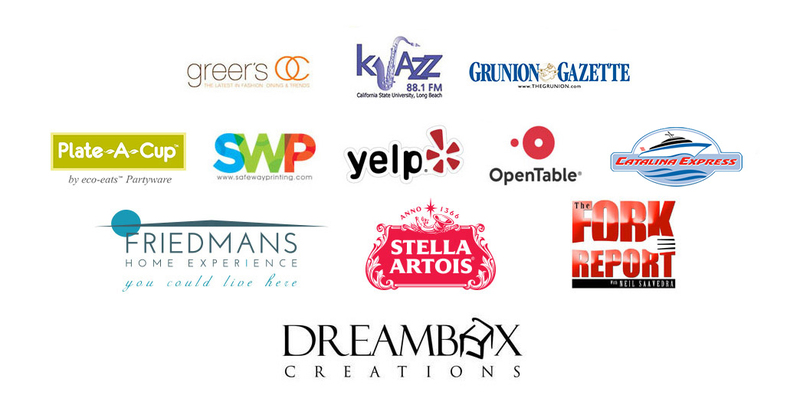 YOU’LL BE IN VERY GOOD COMPANY WITH THE LIKES OF THE GRUNION GAZETTE, KJAZZ 88.1, BLUE MARBLE COCKTAILS, FRIEDMAN’S HOME EXPERIENCE, KFI-AM 640 “THE FORK REPORT WITH NEIL SAAVEDRA,” GREER’S OC, YELP, OPENTABLE AND DREAMBOX CREATIONS (they designed our logo and website!). SPONSORSHIPS ARE AFFORDABLE, TOO, AND YOUR LOGO WILL BE INCLUDED IN PRINT AND ONLINE ADS, DIGITAL MARKETING, COLLATERAL MATERIALS, OUR WEBSITE, PRESS RELEASES AND MORE.